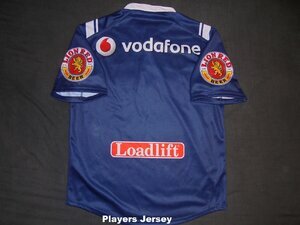 Quite often its mistakenly referred to as the Auckland Rugby League Centennial jersey. Problem is the ARL was founded in 1909. 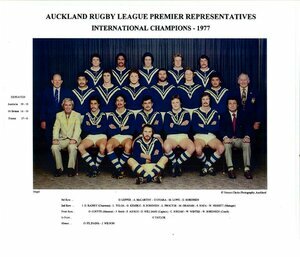 This jersey was actually made to mark 30 years since the Auckland team of 1977 beat Australia, Great Britain and France all in the space of just 20 days at Carlaw Park. Puma's jersey was taken straight from the 1977 jersey and was a faithful reproduction of the original from the colour and shade to the chevron detail. Originally there was only meant to be a limited run of 300 made and offered for sale but due to the huge amount of public demand Puma made at least one more run. There would be some 1000 of these made. OFFICIAL REPLICA - One of the most desirable jerseys around. 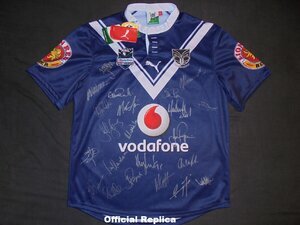 Most have no problems getting $150 second hand with most going for the price of a new jersey. Sizes from XL on are in high demand and can get $200 plus. PLAYERS JERSEY - Same jersey but with a large white number on the back. Never seen one for sale and any match worn example would fetch $400-$800 depending on who wore it.